Venez faire l'expérience de ce pool house joliment décorées. Cette maison offre tout ce dont vous avez besoin pour les vacances Mickey Mouse parfait! Il dispose de 4 chambres, 3 salle de bain complète, 2 suites de maître et une piscine privée et un spa. Céramique et plancher de bois franc dans toute la maison. Cette magnifique maison est 7. 5 miles à Disney parcs à thème, un couple de miles de Wal-Mart Super Center, restaurants, et à quelques minutes de marche de Walgreen et CVS. Cette maison située au 5 étoiles de villégiature Glen ruisseau. Il est très bien aménagé avec ligne de palmier haut de la rue. La communauté disposent d'une grande piscine, club house, centre de fitness, court de tennis, salle de jeux et une aire de jeux. En entrant dans la maison, vous remarquerez plafond de volume dramatique dans toute la maison, un grand plan d'étage ouvert avec une grande salle à manger et cuisine, salle de séjour avec air hockey et un canapé-lit / siège combo questionnaire. Nous avons fourni la maison avec le confort, la beauté et le luxe à l'esprit: 8 personne table à manger, élégant et romantique chambre à coucher principale dispose d'un lit Queen et King lit dans une autre suite de maître, cuisine a tous les appareils neufs et de commodités pour vous d'utiliser ! Nous avons TV dans toutes les chambres à coucher et certaines avec TV / DVD Combo. Tous les 6 TV sont la TVHD et la maison est prête Internet, afin d'apporter votre ordinateur portable! Toutes les chambres ont 100% coton 300 literie fil de luxe. La buanderie contient une laveuse et sécheuse, fer et planche à repasser. Détendez-vous dans votre piscine privée détenue et spa après une longue journée d'été chaud ou déguster votre café ou des cocktails en soirée du matin au bord de la piscine dans une détente totale. Nous nous soucions beaucoup que vous avez des vacances remplie de plaisir, de détente et nous avons réfléchi que, dans chaque petit détail. Nous avons fourni pour vous une partie d'une maison type de vacances qui dispose d'équipements vraiment extraordinaires, est magnifiquement décorée, impeccablement propre, et merveilleusement équipées avec toutes les commodités de la maison. 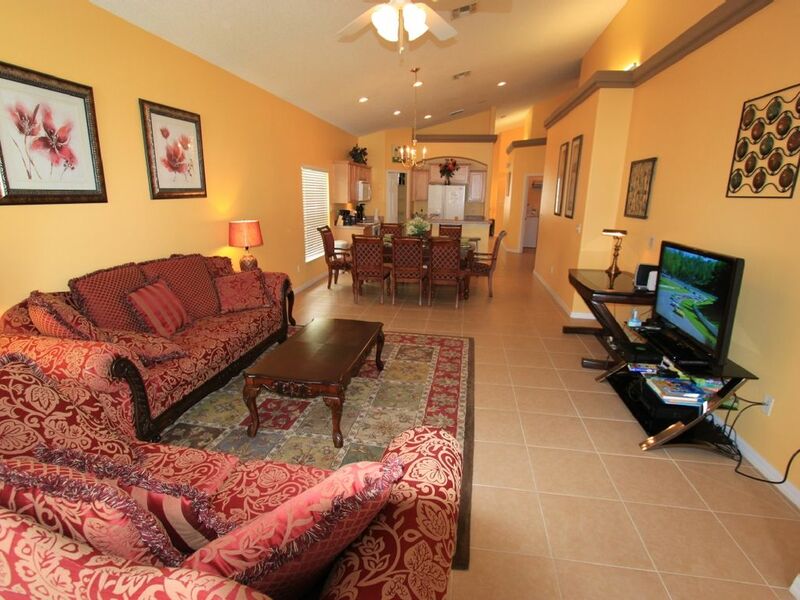 Nice central Florida house rental. Nice house. Convenient location. Quiet neighborhood. My family spent 6 nights in Vivian's lovely home over the Christmas holidays. It was very much like a home away from home and we were immediately comfortable. Vivian was also very helpful before and after our stay, and was never more than a quick message away. House rules were also pretty straightforward and available in a manual on-site. It was conveniently close to everything e.g. Publix, Walmart, Walgreens, CVS and a short drive to all major parks. Very quiet community. A couple things to note however: the walls are quite thin and sound carries easily from room to room; also the pool heating system may need attention. It never quite seemed like the water was heating. Apart from that we enjoyed our stay and would return. We had a terrible experience. Things were extremely dirty and broken in the house. We paid for pool heat and couldn't get it. No resolutions were offered while we were at the house so we switched to a different home after two days of being there. The owner is rude and unprofessional. She refused to return any of our money to us even though we ended up not staying because she stated the reasons we left (could not use pool or hot tub, broken microwave, washer spin cycle didnt work, dirty house) werent good enough reasons. We are currently working with VRBO to get our money back but she is fighting it and has been distasteful this whole time. She will get on here and tell a different story but I have messages and photos to prove otherwise. Keep your money and go elsewhere! Just a friendly warning. We have stayed in Davenport several times now and the homeowners are awesome and houses are always great! Dont end up screwed out of a ton of money! Thank you for your feedback. We are so sorry to hear that our house was not to your satisfactory. We would like to apologize for the malfunctioning of the pool heating system and the microwave, both of which occurred spontaneously with no prior notice. The pool heating system was purchased less than 3 years ago and is still under full manufactory warranty. Unfortunately, the warranty company does not work on Sundays, but the issue was checked on Monday and fixed the next day. A brand-new microwave was ordered and has since been installed. When we were made aware of the situation, we promised to refund the pool heating fee for the days it did not work. This, however, does not justify asking for a full refund of the rent, which is unfeasible given the fact that pool heating is separate from the actual rent fee and given the unpredictable effects of cold weather on the system. Pool heating in the winter is not only expensive, but often unreliable, and no amount of maintenance precautions taken can fully prevent an issue from arising. When the outside temperature is below 40F, we must shut down the system to prevent issues like such due to freezing. Therefore, given these circumstances, we gladly offered a full refund for the surplus pool heating cost, however as much as we would have wished for you to have a better experience, we cannot refund the entire rental cost for the uncontrollable malfunctioning of the pool heating system and the microwave. We must also stress that it is imperative for those who want pool heating to request it in advance, as opposed to the night before, since the system is not always reliable and by then we would have discovered the problem and fixed it in a timely manner. This property is managed and cleaned by a licensed professional management company has been listed on HomeAway for 7 years. We have high standards for our property and we have received many exceptional reviews. We offer a 4 bedroom, 3 bath, 2 master suite house with a private pool and spa, so for charge less than a three star hotel room, we believe our property should be respected and valued regardless of the unexpected issues encountered. Nonetheless, we take all guests’ feedback into consideration to better our services. I hope that in the future you will give us another chance. I am glad that you like our house. The pool is maintained and cleaned by local professional pool company. They come every week to add chemistry and wash the pool deck etc. If guest ever find the pool is cloudy, sometimes it could happen after a heavy rain, please call management company immediately. They will check and call professional if necessary. Please do not delay the call and leave the house unsatisfied. My property manager said you never called them on this issue. Thank you for choosing our house for your vacation and welcome visit us again in future. Very clean nice house. Great location. Pool was great. 4 chambre / 3 famille de bain villa conviviale Belle de luxe est situé à seulement 7. 5 miles (12km) ou à 15 minutes des portes de Walt Disney World. Avec piscine privée et un spa, dans la communauté de villégiature 5 étoiles Glenbrook. La communauté Glenbrook a un club house, un centre de fitness, une aire de jeux, courts de tennis et de volley-ball de sable, salle de jeux ainsi que d'une grande piscine avec champignon fontaine, vous pouvez utiliser gratuitement pendant le séjour.